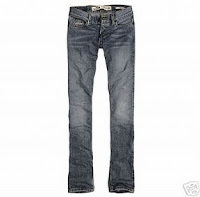 This jeans from hollister is just too cool. I love it and had order one already and hope it'll arrive soon. Its just my style and I can't wait of receiving my order which is 2 weeks from now. It is from America and soon as I see this style I grab and order straight away. Ohhhhh, I so love this hollister jeans. Plus the Size is perfect for me which is 0 US size...we dont have size 0 here so the smallest we can get is size 6 which is my size and hopefull size0 US and size6 UK would be the same.